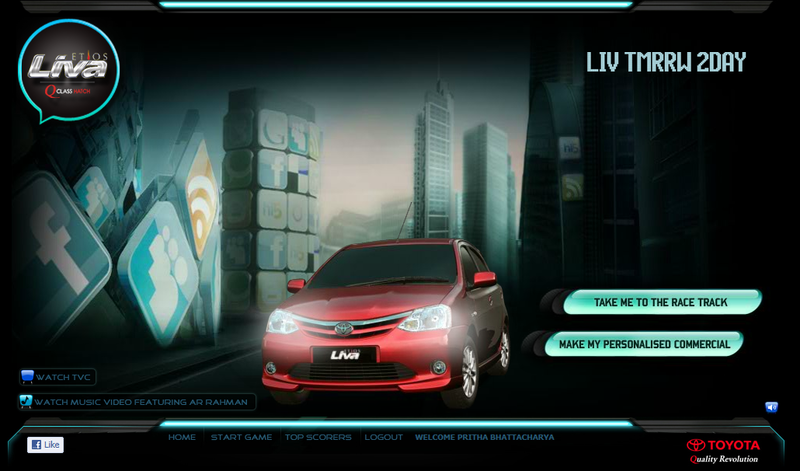 The site for Toyota Etios Liva looks like a mini ‘social road’ what with Facebook, Twitter, Hi5, Feedburner icons. You can choose to login via Facebook or get a new login-password (personal bugbear). It asks for your picture which could be a webcam pictures or an image upload. What is cool is that your name and your picture gets used in roadside posters on an interesting 30 seconder that has been created as an intro to the game – they call it the ‘personalized commercial’. There is an addictive race which you can check out too. It is simple to maneuver with keyboard keys. Users can share their scores and the personalized TVC with friends via Facebook. The look and the premise of the both these elements ties in with what you see on the Liva commercial. I don't have a reason to go back to the site but I am sure there will be users who would want to win the race track and would come back to compete. Apart from the engagement driving elements, you can watch the TVC and the Music Video featuring Rahman on the page. Auto brands are using digital for interesting executions which is great news. Check what Ford Fiesta is doing. #PoweringYourCareer with Mentoring : A two-way street!